When I created a landing page for my eCommerce consulting business I had to use Contact Form 7 plug-in for WordPress. Contact Form 7 is very popular solution, but probably not the most user-friendly, so if you want to integrated it with Google Analytics to measure your conversion it is becoming a little bit tricky. 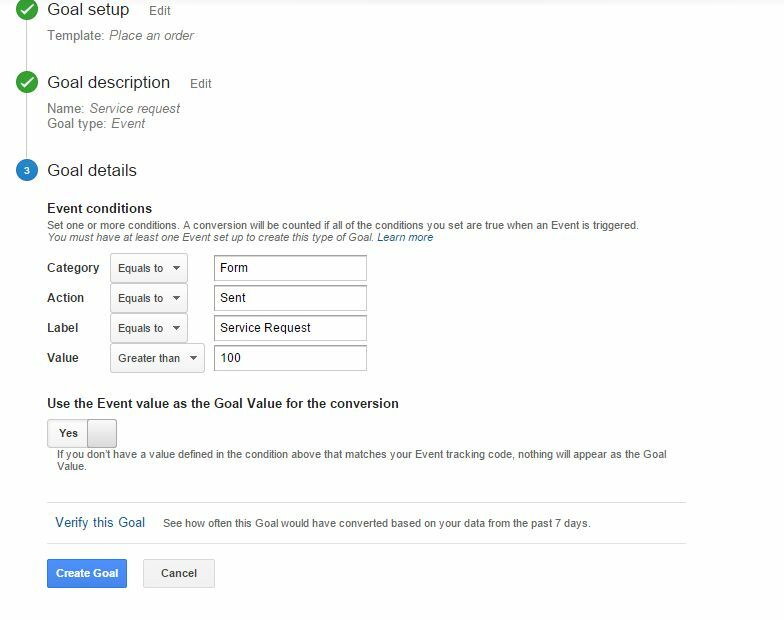 The second guide is a good start, it tells you how to set-up event tracking, but if you want to set-up goal and track conversion you need to do few extra steps. For the sake of having a complete guide, I’ll describe below the whole process of setting up Universal Google Anallytics goal for Contact Form 7 WordPress plug-in. Follow the usual process of setting up contact form for your WordPress website using Contact Form 7 plug-in. If you need help with that, check the official documentation, it is pretty comprehensive. In this box you’ll need to insert a piece of code that will send to Google Analytic a notification when the form is successfully submitted. If you need more in-depth description of the parameters you can check Google Analytics help. On the step 2 select select Event as a type of the goal. You can also define here you own name for the goal. Then press Next step button. 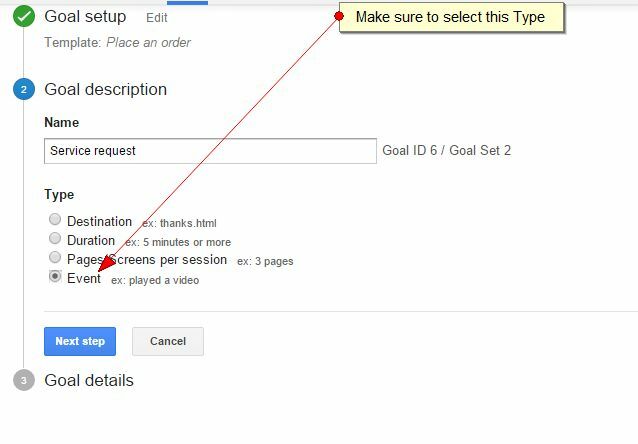 Goal setting in Google Analytics, step 2. At the final stage we need to define event parameters. That’s it, click to Create Goal button and your goal is created! Make sure that the page where you set the form with the code has Universal Google Analytic tracking code, without the code the form will not work properly – submissions will not be tracked and moreover, your website users will not see success/thank you message after they submit the form. If you are not sure does it exist, use View Page Source functionality of your browser and check for it. It should look like one on the screenshot below (with your individual number after UA). You can find your code in Admin/Property/Tracking Info section of your Google Analytics.